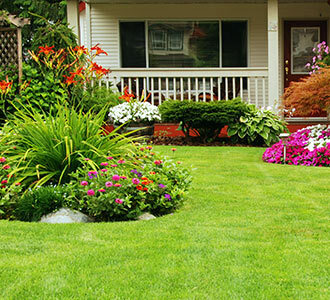 When it comes to keeping your lawn healthy, trust the professionals at Greenbloom Landscape Design. Our experience grants us the ability to understand what is required to properly fertilize each property. Helps plants and grass grow by providing nutrients that may be missing from the soil. Works most effectively after a heavy rain or a good watering. Wait one or two days for grass to dry and apply fertilizer. Ground should be between 10°C and 18°C (50°F – 65°F), as this is the temperature most grasses will grow. Use a broadcast spreader to apply the fertilizer. DO NOT spread by hand. Fill spreader on a hard surface or over a tarp. Keep hopper closed to prevent spillage. If fertilizer spills, sweep it up. Do not allow rain to wash it away. Follow spreading directions on bag. Err on the side of less rather than more. Apply in a grid pattern to ensure even coverage. Once per year. 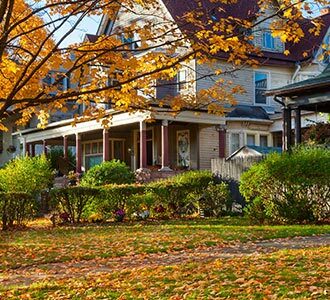 Second application could be needed depending on your lawn’s health. First fertilizer application should be mid-April when the grass has started to grow. Second application if needed should be done 4 weeks later in mid-May or early June. Spring Late spring second application only if necessary. Primary fertilization in late spring or early summer. Summer Early summer if the second application was not done in late spring. Late summer if primary application will not be done in the fall. Second application at the end of summer if necessary. Fall Primary fertilization in the fall. Do not apply. Lightly water lawn to wash fertilizer off grass and into soil. Water your lawn until the ground cannot absorb more water. Continue watering daily for a week. Nitrogen (N) – Helps the plant grow, and assists with the storage and usage of energy. Phosphorous (P) – Builds structural strength, aids root growth, and promotes blooming and seed production. Potassium (K) – Supports growth and development. Contributes to quality, impacting size, shape, colour, and taste where applicable. What Do the 3 Numbers Under N-P-K Represent? Indicates the concentration of each nutrient in the bag. A “0” shows none of that nutrient is present. Why Do the 3 Numbers Vary with the Season? Plants need different nutrients depending on the stage of life cycle they are in. No. Fertilization and weed control should be two separate products and events. What is Corn Gluten in Weed and Feed, and How Does It Work? Corn gluten is a by-product of corn processing. It works by preventing seedlings from creating a strong root system. It does not prevent germination of weeds.